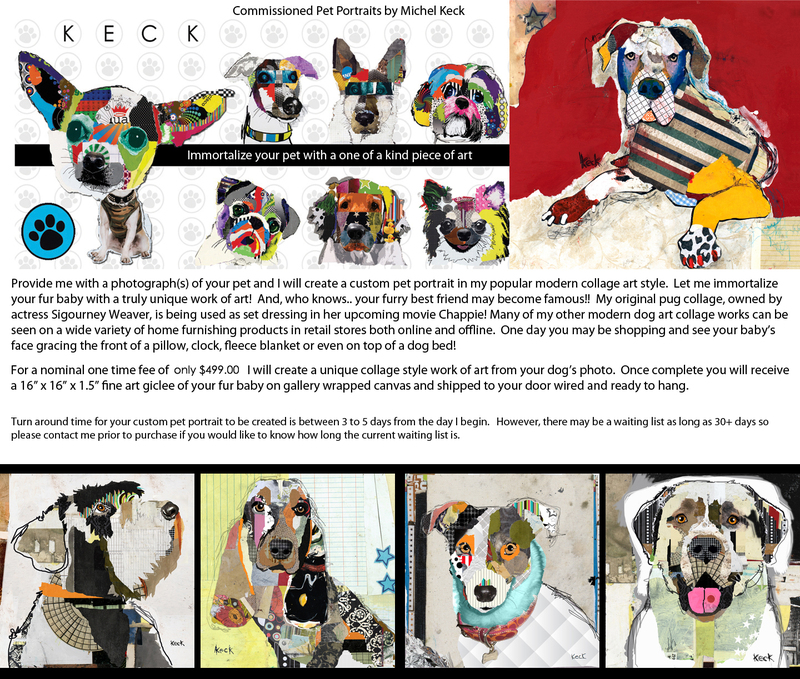 ONE OF A KIND MODERN ART PET PORTRAITS BY MICHEL KECK: Modern Custom Dog Art of YOUR PET immortalized by artist Michel Keck in her famouse collage art style. on gallery wrapped canvas. Your unique piece of art will arrive at your door wired and ready to hang. If you are outside of the U.S. you must phone me or email me first to see what your additional shipping charge will be on your commission to your country. To purchase a custom commissioned pet portrait of your baby now simply hit the ADD TO CART button on the top right hand of your screen. Email photographs of your pet to me direct at michel@michelkeck.com. Turn around time for a collage takes usually 3 to 5 business days from the time I begin. However, the waiting list can be as long as 30+ days so please contact me prior to purchase to find out how long the current wait time is. Dog Art Prints > PET PORTRAIT COMMISSIONS - Immortalize Your Pet in Art!